December 9, 2015, Queens, NY Manny “Pacman” Pacquiao will announce on Friday who he will face in his final fight scheduled for April 9, 2016 at MGM Grand Las Vegas. According to many boxing insiders, Timothy Bradley is the odds on favorite to be the opponent. Bradley (33-1-1, 13 KOs) looked impressive in his last fight against Brandon “Bam-Bam” Rios with new trainer Teddy Atlas. Pacquiao (57-6-2, 38 KOs) lost his last fight earlier this year in the mega-fight against Floyd Mayweather. Pacquiao claimed he tore his rotator cuff before the fight which led to his losing by unanimous decision to Mayweather in a fight that did not live up to its hype. 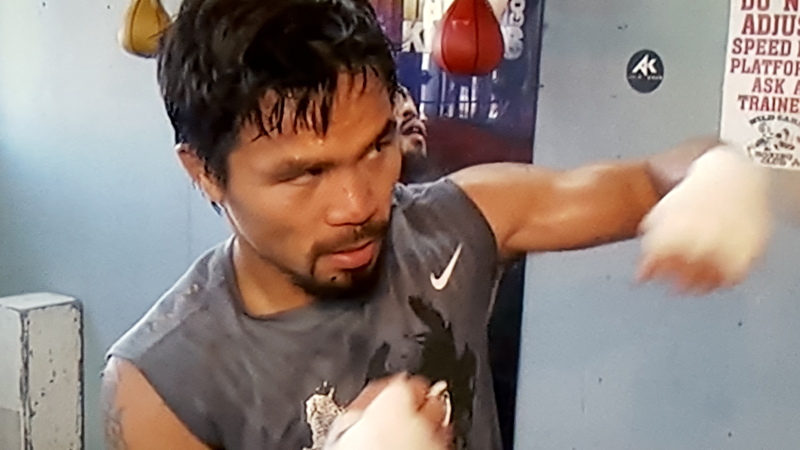 Pacquiao’s revelation led to his being hit with several lawsuits with the claimants maintaining they paid money for a fight without being made aware that Paquiao was “damaged goods” going into the fight. More damaging to Pacquiao was how his claim hurt his status among the boxing establishment, his boxing peers, and the fans alike. The other two possible opponents for Pacquiao are Amir Khan (31-3, 19 KOs) and Terrence Crawford (27-0, 19 KOs). Khan appears to have his sights set on welterweight titlist Kell Brook. Crawford is an up-and-coming star in the sport who HBO is solidly behind. However, while Crawford is a known commodity inside boxing circles and with boxing fans, he hasn’t yet transcended the sport. That leaves Bradley. Bradley and Pacquiao have fought twice. The first fight ended in controversy when Bradley was awarded the decision in a fight that many thought he lost. Pacquiao won the rematch by unanimous decision, and there was no demand to see a third fight even though the fighters split the first two fights. What has changed is that Bradley’s stock as a fighter has risen while Pacquiao’s stock has fallen. Pacquiao would probably be the favorite but there would be many pundits and bettors who would pick Bradley. If Pacquiao is impressive in his last fight, don’t expect the April 9th fight to be his last. He wants another shot at Mayweather, and despite earlier statements, Mayweather would fight Pacquiao again if he could command a payday close to what he received in the first fight with Pacquiao. A Mayweather-Pacquiao rematch could take place in the fall of 2016. Like many things in boxing, Pacquiao’s announcement on Friday will fuel much speculation and raise more questions than answers. Professor Clifford Benton can be reached at @clifford.benton.